Media responsible for JJ-JAK "Bad Blood"
VETERAN POLITICIAN and industrialist, Mr. J. Attoh Quarshie, has blamed sections of the media for deepening the seemingly acrimonious relationship between ex-President Flt. 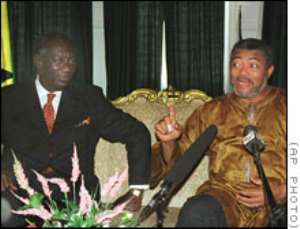 Lt. Jerry John Rawlings and the incumbent, Mr. John Agyekum Kufour. "There is "acrimony" between them. As long as they belong to different political parties, their ideas will be different, but that does not mean they are at war. If you think that there is acrimony between them, then put them in a ring for them to fight, so we see who is who... Of course, as politicians, they may compromise at certain points, but nothing compels them to come together." Speaking to The Chronicle in a chat in response to the refreshing interaction between the two during both the Adae Kesse and the 5th anniversary celebration of Otumfour Osei Tutu II, the Asantehene of the Asanteman Council, and the funeral of the mother of Nana Akuffo Addo-Danquah, the Minister of Foreign Affairs at Kyebi in the Eastern Region, Mr. Attoh-Quarshie observed that Rawlings demonstrated his democratic right as a law abiding citizen of this country by exchanging the necessary greetings with President Kufour at both fora. "It is strange that a section of our people still have little knowledge of their own culture. Rawlings, by culture, knows that whenever a political seat is handed over to another person constitutionally, the one handing over has a moral obligation to recognize the new occupant of the seat and respect him. It shame for some people to read different meanings into Jerry Rawlings' saluting of John Kufuor," he said. According to the veteran politician, Mr. Rawlings' gesture at both places must open the way for followers of both parties to emulate. "His gesture must be commended. It was unfortunate that his enemies are muddying the waters to drive a wedge between the two. There is no need for people to make unnecessary comments about their meeting. It is something that any civilized and democratic person is obligated to do," he pointed out. Reacting to publications that the former President took a U-turn at the funeral at Kyebi, Mr. Attoh-Quarshie apportioned the blame to the protocols present. "The seat of the President is not a chieftaincy seat. The protocols did not do well and apart from that there is nothing wrong if another seat is brought closer to President Kufour for Rawlings to sit by him. He continued that despite everything the ex-President should still be given the due respect. Asked about the forthcoming December general elections, the industrialists discounted any possible tension. "I don't think there will be any abnormal tension in the December elections, but that kind of tension may be in the minds of those who predict. Even so, I believe the intentions of such people will not get anywhere," he concluded.